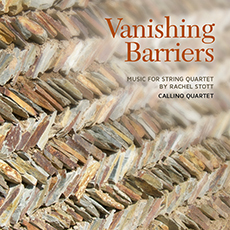 Vanishing Barriers features the superb playing of the Callino Quartet in string quartet music by English composer Rachel Stott. This collection includes two of the composer’s full length string quartets, No. 2 'The Enchanted Lyre' and No. 3 'Wind Through a Symmetry', as well as several shorter pieces. An arrangement of the Irish tune 'Cailín ó chois tSiúre mé', from which the Callino Quartet takes its name, concludes the disc. Displaying an exquisite range of tonal colour and exceptional virtuosity, the Callino Quartet interprets these works with commitment which will engage both connoisseurs and listeners less familiar with contemporary music.